We’re all about using headlines that work around here, and among the most important aspects of a great headline is that it always deliver on its promise. For the third year in a row, Copyblogger Media is hosting one of the biggest parties at SXSW for all of our friends and fans who are able to make it — we call it An Indelicate Diversion. 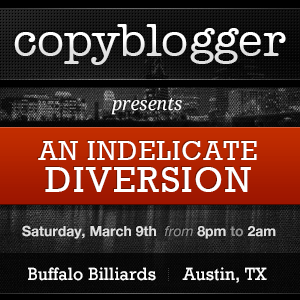 Join us Saturday, March 9th at Buffalo Billiards in Austin for an evening of hilarity, nerdery, and revelry. Doors open at 8pm. From 9pm to 10pm, the drinks are on us. Don’t have a badge? No worries. You don’t need no stinkin’ badges for this. All you need to do is RSVP right here. Our previous parties have had lines that wrapped around the corner, so come early, come thirsty, and come ready to throw down with all of us. You got that link to RSVP, right? We can’t wait to see you there.